For other uses, see Polis (disambiguation). Polis (/ˈpɒlɪs/; Greek: πόλις pronounced [pólis]), plural poleis (/ˈpɒleɪz/, πόλεις [póleːs]) literally means city in Greek. It can also mean a body of citizens. In modern historiography, polis is normally used to indicate the ancient Greek city-states, like Classical Athens and its contemporaries, and thus is often translated as "city-state". 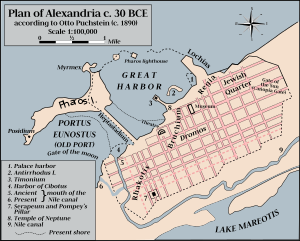 These cities consisted of a fortified city centre (asty) built on an acropolis or harbor and controlled surrounding territories of land (khôra). 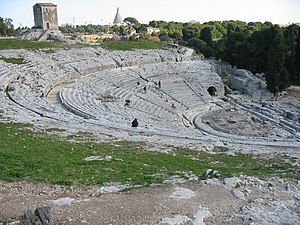 The Ancient Greek city-state developed during the Archaic period as the ancestor of city, state, and citizenship and persisted (though with decreasing influence) well into Roman times, when the equivalent Latin word was civitas, also meaning "citizenhood", while municipium applied to a non-sovereign local entity. The term "city-state", which originated in English (alongside the German Stadtstaat), does not fully translate the Greek term. The poleis were not like other primordial ancient city-states like Tyre or Sidon, which were ruled by a king or a small oligarchy, but rather political entities ruled by their bodies of citizens. The traditional view of archaeologists—that the appearance of urbanization at excavation sites could be read as a sufficient index for the development of a polis—was criticised by François Polignac in 1984[a] and has not been taken for granted in recent decades: the polis of Sparta, for example, was established in a network of villages. The term polis, which in archaic Greece meant "city", changed with the development of the governance center in the city to signify "state" (which included its surrounding villages). Finally, with the emergence of a notion of citizenship among landowners, it came to describe the entire body of citizens. The ancient Greeks did not always refer to Athens, Sparta, Thebes, and other poleis as such; they often spoke instead of the Athenians, Lacedaemonians, Thebans and so on. The body of citizens came to be the most important meaning of the term polis in ancient Greece. The Greek term that specifically meant the totality of urban buildings and spaces is asty (ἄστυ). Plato analyzes the polis in The Republic, whose Greek title, Πολιτεία (Politeia), itself derives from the word polis. The best form of government of the polis for Plato is the one that leads to the common good. The philosopher king is the best ruler because, as a philosopher, he is acquainted with the Form of the Good. In Plato's analogy of the ship of state, the philosopher king steers the polis, as if it were a ship, in the best direction. Books II–IV of The Republic are concerned with Plato addressing the makeup of an ideal polis. In The Republic, Socrates is concerned with the two underlying principles of any society: mutual needs and differences in aptitude. Starting from these two principles, Socrates deals with the economic structure of an ideal polis. According to Plato, there are five main economic classes of any polis: producers, merchants, sailors/shipowners, retail traders, and wage earners. Along with the two principles and five economic classes, there are four virtues. The four virtues of a "just city" include, wisdom, courage, moderation, and justice. With all of these principles, classes, and virtues, it was believed that a "just city" (polis) would exist. Temples, altars, and sacred precincts: one or more are dedicated to the poliouchos, the patron deity of the city; each polis kept its own particular festivals and customs (Political religion, as opposed to the individualized religion of later antiquity). Priests and priestesses, although often drawn from certain families by tradition, did not form a separate collegiality or class; they were ordinary citizens who on certain occasions were called to perform certain functions. Political life: it revolved around the sovereign Ekklesia (the assembly of all adult male citizens for deliberation and voting), the standing boule and other civic or judicial councils, the archons and other officials or magistrates elected either by vote or by lot, clubs, etc., and sometimes punctuated by stasis (civil strife between parties, factions or socioeconomic classes, e.g., aristocrats, oligarchs, democrats, tyrants, the wealthy, the poor, large, or small landowners, etc.). They practised direct democracy. Publication of state functions: laws, decrees, and major fiscal accounts were published, and criminal and civil trials were also held in public. Synoecism, conurbation: Absorption of nearby villages and countryside, and the incorporation of their tribes into the substructure of the polis. Many of a polis' citizens lived in the suburbs or countryside. The Greeks regarded the polis less as a territorial grouping than as a religious and political association: while the polis would control territory and colonies beyond the city itself, the polis would not simply consist of a geographical area. Most cities were composed of several tribes or phylai, which were in turn composed of phratries (common-ancestry lineages), and finally génea (extended families). Citizens with full legal and political rights—that is, free adult men born legitimately of citizen parents. They had the right to vote, be elected into office, and bear arms, and the obligation to serve when at war. Citizens without formal political rights but with full legal rights: the citizens' female relatives and underage children, whose political rights and interests were meant to be represented by their adult male relatives. Citizens of other poleis who chose to reside elsewhere (the metics, μέτοικοι, métoikoi, literally "transdwellers"): though free-born and possessing full rights in their place of origin, they had full legal rights but no political rights in their place of residence. Metics could not vote or be elected to office. A liberated slave was likewise given a metic's status if he chose to remain in the polis, at least that was the case in Athens. They otherwise had full personal and property rights, albeit subject to taxation. Slaves: chattel in full possession of their owner, and with no privileges other than those that their owner would grant (or revoke) at will. During the Hellenistic period, which marks the decline of the classical polis, the following cities remained independent: Sparta until 195 BC after the War against Nabis. Achaean League is the last example of original Greek city-state federations (dissolved after the Battle of Corinth (146 BC)). The Cretan city-states continued to be independent (except Itanus and Arsinoe, which lay under Ptolemaic influence) until the conquest of Crete in 69 BC by Rome. The cities of Magna Graecia, with the notable examples of Syracuse and Tarentum, were conquered by Rome in the late 3rd century BC. There are also some cities with recurring independence like Samos, Priene, Miletus, and Athens. A remarkable example of a city-state that flourished during this era is Rhodes, through its merchant navy, until 43 BC and the Roman conquest. The Hellenistic colonies and cities of the era retain some basic characteristics of a polis, except the status of independence (city-state) and the political life. There is self-governance (like the new Macedonian title politarch), but under a ruler and king. The political life of the classical era was transformed into an individualized religious and philosophical view of life (see Hellenistic philosophy and religion). Demographic decline forced the cities to abolish the status of metic and bestow citizenship; in 228 BC, Miletus enfranchised over 1,000 Cretans. Dyme sold its citizenship for one talent, payable in two installments. The foreign residents in a city are now called paroikoi. In an age when most political establishments in Asia are kingdoms, the Chrysaorian League in Caria was a Hellenistic federation of poleis. During the Roman era, some cities were granted the status of a polis, or free city, self-governed under the Roman Empire. The last institution commemorating the old Greek poleis was the Panhellenion, established by Hadrian. Derivatives of polis are common in many modern European languages. This is indicative of the influence of the polis-centred Hellenic world view. Derivative words in English include policy, polity, police, and politics. In Greek, words deriving from polis include politēs and politismos, whose exact equivalents in Latin, Romance, and other European languages, respectively civis ("citizen"), civilisatio ("civilization"), etc., are similarly derived. Located on the northwest coast of Cyprus is the town of Polis, or Polis Chrysochous (Greek: Πόλις Χρυσοχούς), situated within the Paphos District and on the edge of the Akamas peninsula. During the Cypro-Classical period, Polis became one of the most important ancient Cypriot city-kingdoms on the island, with important commercial relations with the eastern Aegean Islands, Attica, and Corinth. The town is also well known due to its mythological history, including the site of the Baths of Aphrodite. 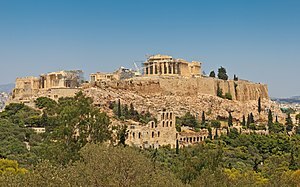 Acropolis ("high city"), Athens, Greece – although not a city-polis by itself, but a fortified citadel that consisted of functional buildings and the Temple in honor of the city-sponsoring god or goddess. The Athenian acropolis was the most famous of all acropolises in the ancient Greek World and its main temple was the Parthenon, in honor of Athena Parthenos (Athena the Virgin). Constantinopolis or Constantinople ("Constantine's city"), the former name for Istanbul, Turkey. Istanbul (derived from the Greek phrase "εἰς τὴν Πόλιν" meaning "to the city"), Turkey. Some cities have also been given nicknames ending with the suffix -polis, usually referring to their characteristics: Cardiff, Wales, UK, once dubbed "Terracottaopolis" due to its fame for buildings faced in terracotta, local red brickwork and ceramics. Gallipoli, city in Apulia, Italy. It probably means "Beautiful City" (from Greek "Καλλίπολις"). ^ Polignac, François (1984), La naissance de la cité grecque (in French), Paris . ^ MacDowell, Douglas Maurice (1986). The Law in Classical Athens. Cornell University Press. p. 82. ISBN 9780801493652. ^ Dmitriev, Sviatoslav (2005), City government in Hellenistic and Roman Asia minor, p. 68, ISBN 0-19-517042-3 . ^ Wilson, Nigel Guy (2006), Encyclopedia of Ancient Greece, p. 627, ISBN 978-0-415-97334-2, archived from the original on 2015-03-17 . ^ Howgego, Christopher; Heuchert, Volhker; Burnett, Andrew (2007), Coinage and Identity in the Roman Provinces, p. 158, ISBN 0-19-923784-0 . Ando, Clifford. 1999. "Was Rome a Polis?". Classical Antiquity 18.1: 5–34. Brock, R., and S. Hodkinson, eds. 2000. Alternatives to Athens: Varieties of Political Organisation and Community in Ancient Greece. Oxford: Oxford Univ. Press. Davies, J. K. 1977–1978. "Athenian Citizenship: The Descent Group and the Alternatives." Classical Journal 73.2: 105–121. Hall, J. M. 2007. "Polis, Community and Ethnic Identity." In The Cambridge companion to Archaic Greece. Edited by H. A. Shapiro, 40–60. Cambridge, UK: Cambridge Univ. Press. Hansen, M. H., and T. H. Nielsen, eds. 2004. An Inventory of Archaic and Classical Poleis. Oxford: Oxford Univ. Press. Hansen, M. H. 2006. Polis: An Introduction to the Ancient Greek City-State. Oxford: Oxford Univ. Press. Hansen, M. H., ed. 1993. The Ancient Greek City-State: Symposium on the Occasion of the 250th Anniversary of the Royal Danish Academy of Sciences and Letters, July 1–4, 1992. Copenhagen: Royal Danish Academy. Hansen, M. H. 1999. The Athenian Democracy in the age of Demosthenes: Structure, Principles and Ideology. 2d ed. London: Bristol Classical Press. Hansen, M. H., ed. 1997. The Polis as an Urban Centre and Political Community. Copenhagen: Royal Danish Academy. Jones, N. F. 1987. Public Organization in Ancient Greece: A Documentary Study. Philadelphia: American Philosophical Society. Kraay, C. M. 1976. Archaic and Classical Greek Coins. Berkeley: Univ. of California Press. Osborne, R. 2009. Greece in the Making. 2d ed. London: Routledge. Millar, F. G. B. 1993. "The Greek City in the Roman Period. In The Ancient Greek City-State: Symposium on the Occasion of the 250th Anniversary of the Royal Danish Academy of Sciences and Letters, July 1–4, 1992. Edited by M. H. Hansen, 232–260. Copenhagen: Royal Danish Academy. Polignac, F. de. 1995. Cults, Territory, and the Origins of the Greek City-State. Translated by J. Lloyd. Chicago: Univ. of Chicago Press. van der Vliet, E. 2012. "The Durability and Decline of Democracy in Hellenistic Poleis." Mnemosyne 65.4-5: 771-786. This page was last edited on 6 April 2019, at 00:05 (UTC).